1 What the heck is the Illogicopedia? Sounds like a rip-off of Uncyclopedia. 2 Oh, right then. Still sounds like Uncyclopedia. 4 So it isn't really like Uncyc at all then? OK, what about interlanguage links? 5 I have more questions. Ah, this should be the page for the Illogicopedian Embassy/Consulate. Indeed it is! What the heck is the Illogicopedia? Sounds like a rip-off of Uncyclopedia. Well, it is and it isn't - well, mostly it isn't. 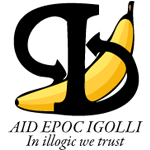 Illogicopedia bills itself as the 'encyclopedia of nonsense and surrealism', a place where the Dada ethic lives on in spades, and sometimes in shovels too. Oh, right then. Still sounds like Uncyclopedia. You'd be partially right: the Illogicopedia was founded by a group of Uncyclopedia users who were interested to see what would happen if the Uncyclopedia were more 'open', much like it was in the early days. The Illogicopedia was founded as an inclusionist wiki accepting all types of humour but mainly that with a surreal edge. um ... just read this. So it isn't really like Uncyc at all then? OK, what about interlanguage links? This page was last edited on 26 August 2018, at 16:28.